This wiki cheese category page contains detailed information and photographs of cheeses produced in the French island of Corsica. Corsica (French: Corse) is an island in the Mediterranean Sea. It is located west of Italy, southeast of the French mainland, and north of the island of Sardinia. 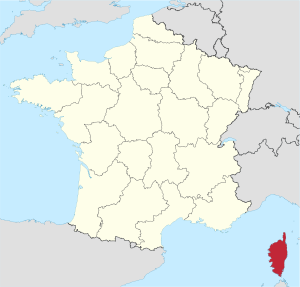 Corsica is one of the 27 régions of France, although strictly speaking Corsica is designated as a "territorial collectivity" (collectivité territoriale) by law. It was once briefly an independent Corsican Republic, until being incorporated into France in 1769. Napoléon Bonaparte was born in Ajaccio, where his ancestral home, Casa Buonaparte, is also located. Corsica was originally formed by volcanic activity making it the most mountainous island in the Mediterranean, as such is far better suited to sheep and goats, hence the prevalence of these types of cheeses. Pages in category "Corse cheeses"
Page modified 18:25, 16 November 2015.